Notice a trend? I am knee deep in spaghetti squash right now thanks to a huge box from a local farm here in Squashington. You may think Washington is the apple and pear capitol of our country but this time of year, it’s squash central. Not complaining because you know I love me some spaghetti squash. Whether it be a base for meatballs, turned into a low-carb pepperoni pizza, stuffed with mushrooms and beans, in the slow cooker with some sauce or as a casserole, it’s one of our favorite seasonal squashes. This Spicy Sausage and Vegetable Spaghetti Squash Casserole is healthy comfort food at its finest. It is loaded with a ridiculous amount of vegetables and is naturally dairy free, grain free and lower carb. If you are a cheese lover, you can easily add some ricotta cheese to the filling mixture and even some shredded or sliced mozzarella and grated Parmesan on top. Best part of this casserole is that it reheats beautifully, can be made in advance and freezes great in individual portions. I have made this with both Spicy Italian Pork Sausage and Spicy Italian Chicken Sausage. Both work really well. If you use fresh sausage (uncooked), make sure to add it with the onions and garlic and saute until there is no pink visible. The spaghetti squash needs to be cooked in advance. There are many options. Toss the squash in the oven up to 2 or 3 days before when you are cooking something else. Click here for How To Roast instructions. Microwave the squash and refrigerate until ready to use. Cook it in the slow cooker with the sauce and refrigerate until ready to use. This Evo oil sprayer is my new favorite thing. I kind of wish I had gotten the stainless steel version but maybe I’ll put it on my holiday wish list. I used a 9 x 13 (3 quart) glass baking dish. You can assemble this in advance, cover and refrigerate for up to 24 hours before cooking. Finely chop the garlic and onion or use the food processor to save time. If using fresh sausage, split open casings and crumble into a bowl. If using pre-cooked sausage, dice into bite sized pieces. Clean mushrooms, trim stems and slice into 1/8" slices. Crack eggs into a dish or bowl and gently beat until fluffy. Set aside. Heat a large frying pan over medium high heat. Once hot, add olive oil and then chopped garlic and onion. Cook, stirring constantly, 3 to 4 minutes. Add sliced mushrooms, baby spinach leaves, chopped sausage and pinch of salt. Continue cooking, approx. 3 to 4 minutes, until spinach is wilted and both the spinach and mushrooms have released some liquid. Remove from heat and drain the liquid. Add (room temperature or chilled) sauce and pre-cooked spaghetti squash and stir until well mixed. Finally, add in beaten eggs and stir until well combined. Pour mixture into oiled baking dish and use a spatula to smooth and flatten. Bake for 60 minutes. Remove from oven and allow to cool 15 minutes before cutting and serving. Once cooled, cut into 8 slices, serve topped with fresh parsley and Enjoy! This turned out amazing. It was perfect! I love it. Thanks! Have you ever made this and froze it? At what point would you freeze? Hi Marlea – yes, I have. You can freeze it right before you would cook it in the oven and then cook from frozen (leave extra time) OR after fully cooked and cooled and then just reheat it. 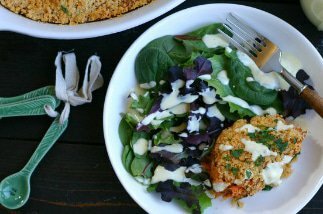 This recipe is great inspiration for a Whole 30 dinner!! I used a recipe that I like for making homemade turkey sausage and a can of Contadina Italian Herbs tomato sauce (Whole30 compliant!) and threw some random veggies in there as well. I will definitely make this again. Thanks for the awesome idea!! I made this without mushrooms, and plus 1 tsp of red pepper flakes and about 3 large tbs ricotta cheese. I baked it on Tuesday evening, then refrigerated it whole (we unexpectedly had to skip a home made dinner that night, but it was all prepped). On Wednesday I reheated it in the oven: covered in foil, at 350 for about 45 minutes. It was SO delicious! I did, however, have trouble with consistency. It was not firm at all. I’m not sure what exactly went wrong. Is it because it sat overnight and was reheated? Is it because I had too much liquid (did I need more squash or less sauce)? Or is it because the squash released extra water, and I should have drained it by gently pressing in a colander as recommended in the comments? Next time (oh, yes, next time) I’ll drain the squash better and see how that works. Hi Crystal! Two things immediately come to mind – one drain the squash really well and two, this is meant to be cooked UNCOVERED so the liquid can evaporate during cooking. Glad you liked the flavor but I am sure that was frustrating! Try using frozen spinach that you have drsined well. Spinach has so much water. Also, add an extra egg or two. It says 4 large eggs, but if your eggs aren’t that big, add some more. I used about 1/4 c egg substitute too. Made this last night for my mom and girlfriend. They raved about it, as did I. It was even better today. Next time I am adding cheese. Love spaghetti squash but it seems to weep liquid and water down my sauces or any casserole I put it in. Since you use is so much, do you see this issue and how do you combat that issue? I’m cooking my squash now and am putting this together tonight. I was thinking about setting it on paper towels for a few hours. Would love to hear your thoughts. Hi Todd! I do see that issue sometimes. You can put the cooked spaghetti squash into a colander and then gently squeeze out the liquid before using. Also, I have found that microwave cooking lends to the least moist result so if you are OK with the microwave, try that! As for this casserole, it bakes uncovered at high heat and a lot of the moisture cooks out. Hope you love it! can spaghetti squash be frozen. Once cooked, yes it can! Im a huge fan of spaghetti squash but never know what to do with it! This recipe is a great idea for a weeknight meal that every one will die for! Can’t wait to try! The EVOO sprayer, does it clog? So many do! Every other one I’ve tried eventually clogs. So far, I have been using this for 4 months and NO CLOG! sorry – meant to say make the squash before…. Hi – Do you HAVE to make before? Just saw this and would love to make for a pot luck that is tomorrow? Did I miss the boat? Is this a moisture issue? You do otherwise the squash is just hard. It only turns into “spaghetti” once cooked. Sorry, I was unclear. You mentioned the squash needs to be cooked the day before. Do you have to cook it the day before or can the squash be made the same day you put it in the casserole. You can make it the day before or right before you put it in the casserole – whatever works! Just let it cool a little before mixing in the egg or it might start cooking it. Being knee-deep in any kind of squash is a good thing! Really fun recipe for spaghetti squash. Who doesn’t like a casserole? Good stuff — thanks. Thanks John – we had spaghetti squash for dinner again tonight. I am still not sick of it!